Marcus Verrius Flaccus (c. 55 BC – AD 20) was a Roman grammarian and teacher who flourished under Augustus and Tiberius. He was a freedman, and his manumitter has been identified with Verrius Flaccus, an authority on pontifical law; but for chronological reasons the name of Veranius Flaccus, a writer on augury, has been suggested (Teuffel-Schwabe, Hist. of Roman Lit. 199, 4). He gained such a reputation by his methods of instruction that he was summoned to court to bring up Gaius and Lucius, the grandsons of Augustus. He removed there with his whole school, and his salary was greatly increased on the condition that he took no fresh pupils. He died at an advanced age during the reign of Tiberius (Suetonius, De Grammaticis, 17), and a statue in his honour was erected at Praeneste, in a marble recess, with inscriptions from his Fasti Praenestini. Flaccus was also a distinguished philologist and antiquarian investigator. His most important work, De verborum significatu, was the first major alphabetical dictionary in Latin. Though only small fragments remain of the work, it served as the basis for Sextus Pompeius Festus's epitome, also called De verborum significatu. Festus's work was in turn abridged centuries later by Paul the Deacon for the library of Charlemagne. 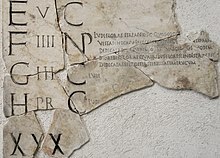 Of the calendar of Roman festivals (Fasti Praenestini) engraved on marble and set up in the forum at Praeneste, some fragments were discovered (1771) at some distance from the town itself in a Christian building of later date, and some consular fasti in the forum itself (1778). The collection was subsequently increased by two new fragments. Res Etruscae, probably on augury. This article incorporates text from a publication now in the public domain: Chisholm, Hugh, ed. (1911). "Verrius Flaccus, Marcus" . Encyclopædia Britannica. 27 (11th ed.). Cambridge University Press. p. 1038. Henry Nettleship, Lectures and Essays.